We are very excited to introduce our newest wine slush product. ​For a number of years now, many of our customers have been asking us to come up with a wine slush mix that is “more diabetic friendly”. We believe that Sangri – LO is such a product. It is the result of a multi-year search and much testing and trial and error. We reached out to manufacturers in different countries until we found what we believe is the best naturally sourced sweetener for our product. Sangri – LO is sweetened with FructeviaTM which, is a mix of crystalline fructose, stevia extract, inulin and magnesium carbonate. According to the manufacturer, FructeviaTM will not spike blood sugar. This was an important feature for us as my wife and I are both diabetic as well. It also tastes more like sugar than any of the other naturally sourced sweeteners that we have ever tried. FructeviaTM is more than twice as sweet as regular sugar so much less is needed. It is also very expensive compared to regular sugar. ​Sangri – LO has the same great flavour of our regular wine slush mix and we have tried to maintain the same sweetness level as well. Some people that have tasted Sangri – LO feel that it is a little sweeter. 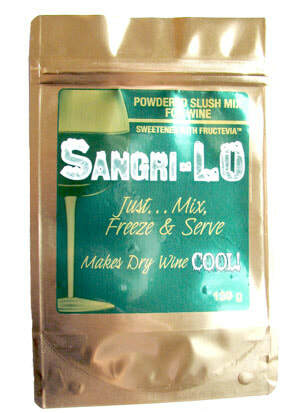 ​Sangri - LO is mixed the same way as our regular wine slush mix so as with our regular wine slush mix, remember to taste it once you have mixed it up with the wine and water, before you freeze it. If you find it a little too sweet, just add more equal parts wine and water until you reach the sweetness level you like and then freeze it. We hope you enjoy Sangri - LO and we would appreciate any feedback that you might have about our new procuct.